Arsenal manager Arsene Wenger reacts during the Europa League semi-final defeat to Atletico Madrid. ATLETICO Madrid have beaten Arsenal 1-0 in the Europa League to reach a fifth continental final in nine seasons and deny outgoing manager Arsene Wenger a last attempt at an international trophy with the Gunners. 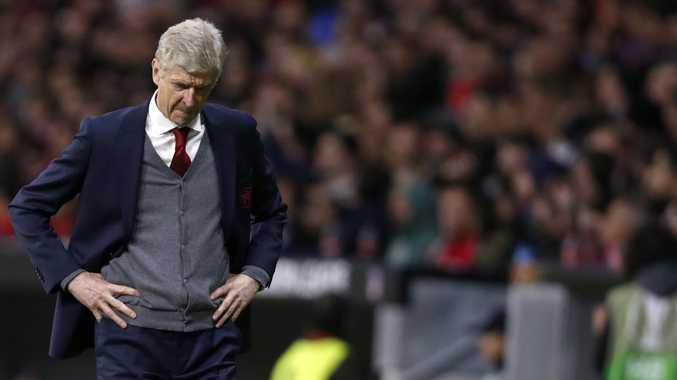 "I'm like the team, very sad and very disappointed," Wenger said. "I'm very frustrated as well. I'm very, very sad to leave the club with this exit." Atletico will be joined in the final by Olympique Marseille, who won 3-2 on aggregate over Salzburg on Thursday after losing the second-leg semi-final 2-1 in extra time. Diego Costa struck in first-half stoppage time for Atletico for a 2-1 aggregate semi-final win after Arsenal lost captain and defender Laurent Koscielny on a seemingly grave leg injury early in the match. Atletico reached their ninth European final and will be gunning for a fourth title, following Cup Winners' Cup success in 1962, and Europa League titles 2010 and 2012. Costa proved a handful for Arsenal when he played for Chelsea and the Spain striker broke the deadlock in a tense game at the Wanda Metropolitano after being played in by Antoine Griezmann. Koscielny was carried off on a stretcher early in the first half with a suspected torn achilles tendon and they struggled to cope with Costa's power and the flair of his attacking partner Griezmann. Wenger's side were blunt in attack and they only had one shot on target, a distance strike from Granit Xhaka, which was not enough to beat goalkeeper Jan Oblak. Atletico didn't create many chances but they always looked in control to reach a fifth European final since 2010. "We're very happy to get to the final. It was important to get to a final - Atleti need it because we're a great team," Costa said. In Marseille's clash with Salzburg, Rolando's extra-time goal sent the French side through to their first Europa League final after a 3-2 aggregate victory over a spirited home side who won the semi-final second leg 2-1. The Ligue 1 team led 2-0 from the first leg in France but were pegged back by the hosts. After a quiet first half, the Austrians took the lead through a brilliant solo strike by Amadou Haidara before Bouna Sarr's own goal made it 2-0. With the tie level on aggregate, the match went to extra time and neither side could find an opening until a Dimitri Payet corner found Portuguese defender Rolando with four minutes left. Marseille play Atletico Madrid in Lyon in the final on May 16.